Burma Banks. Liveaboard diving to Burma Banks. Located 90 nautical miles west of Kawthaung, the Burma banks are far from shore and exposed to wind and waves. Getting to the Banks is a time consuming and diesel guzzling operation that was once worth the effort for the large quantity of very big sharks that could be seen here. Unfortunately the Burma Banks, like many other Mergui archipelago dive sites, were over fished in the early years of this century and are not as shark tastic as they once were. This has prompted some liveaboards to remove the Burma Banks from their itinerary but in the last couple of years there are a few more shark sighting reports so the journey may well be worth it again. The Burma banks consist of a series of submerged sea mounts with flat plateaus around 15-25m below the surface and drop offs over the sides down beyond 300m. They were discovered by exploratory Thailand based dive boat operators and were sensational dive sites in the late 1990’s when divers could be guaranteed to see several species of shark most notably large oceanic silvertips. Also present were white tip reef sharks, large tawny nurse sharks, leopard sharks plus occasional sightings of scalloped hammerhead sharks and tiger sharks. High adrenaline diving which consists of nothing more than descending the anchor line to the plateau and sheltering under a bommie until deco time and/or air runs low. Sharks circle the plateaus (they were previously fed by dive boats). Descending over the drop off and drifting along the wall could produces encounters with hammerheads and tiger sharks. These days the nurse sharks remain but the silvertips are seen much less frequently. Other pelagic species such as tuna, bonito and rainbow runners can still be seen. Manta rays and eagle rays can also be seen on occasion. Coral life is healthy, particularly on the deeper sections of the walls. 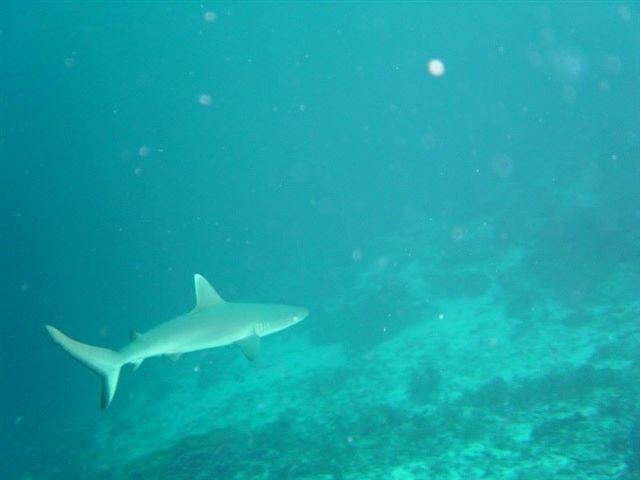 Silvertip bank is closest to Kawthaung and most frequently dived by Burma liveaboards. It is the shallowest seamount at 15m below the surface. The plateau area is about 1km in diameter. Big bank is bigger, about 2km across and still has some large nurse sharks in residence. Rainbow reef is another large bank that has impressive large table corals on the top of the plateau. Roe bank and Heckford bank are the furthest from Kawthaung and also the deepest so are dived less frequently by liveaboard dive boats. Potato grouper and great barracuda can be found here.